Most students begin learning writing schools in elementary or middle school. 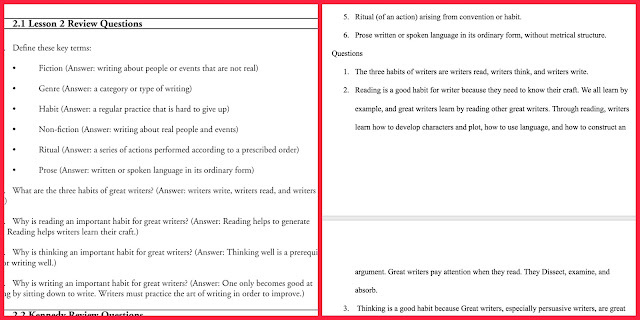 Often, they learn a basic skeleton of how to write an essay, and just keep practicing it, repeating the same frame with new topics and supporting ideas. But while I think this is adequate for fledgling writers, students can become stuck in the process. Some people are naturally good writers, but for some -- like Matthew -- good writing isn't an inherently strong skill. As he enters his senior year, I feel like a clock is ticking on getting him to become a good writer. We were happy -- ok, Mama was happy -- to be chosen to review Persuasive Writing & Classical Rhetoric: Practicing the Habits of Great Writers from Silverdale Press LLC. 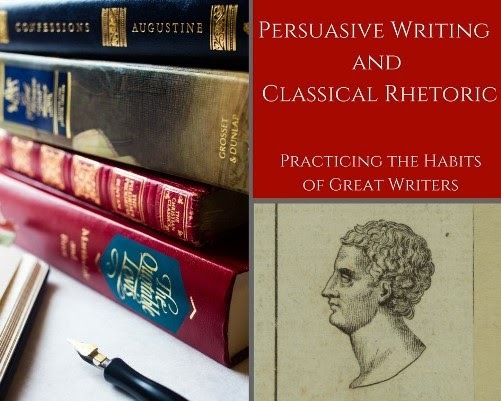 Persuasive Writing & Classical Rhetoric: Practicing the Habits of Great Writers is a year-long (36 week) writing course for high school students. This digital curriculum presents iconic speeches and essays for study, where students learn not only to dissect the persuasion but have models of exemplary writing to model their own after. This is helpful for the student who understands the basics of writing and grammar but struggles with varying sentence structure. (Matthew is one of those types -- I've lost track of how many times I've said to him, "Ok, I understand what you're trying to say, but this is boring me. You need to reword that, so you're not writing every sentence subject-verb-object.") I think it really helps students to see a way to get the same point across but in a more engaging manner. "Rhetoric" is one of those words that has lost its identity over time. In recent times, the word is tossed around to demean or dismiss an opposing and often political, viewpoint. Like the word "ignorant" coming to be a word mis-defined in its substitution for rude, the common use of the word "rhetoric" has come to be synonymous with stereotype and euphemism, implying the speaker is entrenched in "the wrong side." However, a staple of classical education since the time of Aristotle, true rhetoric is probably one of the most eloquent of written and oratorical skills. For all their human faults, I doubt one would accuse the writings of St. Augustine, Benjamin Franklin, or Winston Churchill, as the rantings of "idiots." Well, space is there, and we’re going to climb it, and the moon and the planets are there, and new hopes for knowledge and peace are there. Well, while it might take a fair bit of experimentation, I don't think rhetoric isn't quite as difficult as launching a "flying thermos bottle," as 3-time astronaut Walter M. Schierra, Jr. called it. Every writer has a preferred writing style, but he also brings his own voice to his writings. I like that this program includes so many sample writers! The essays chosen for study have been written by a wide variety of authors. Some are iconic: what American student is unfamiliar with Patrick Henry's emphatic speech that ends, "Give me liberty, or give me death!"? But while other samples are from famed orators, they may be lesser known speeches: Abraham Lincoln is represented not by those proclaimed as President, but the 1854 speech he presented at Peoria. This speech pointed out the flaws in slavery and ultimately began the path that led him to the presidency. Seeing the variety of styles gives a student the opportunity to meld different ideas, makes his writings more authentic and persuasive. He becomes able to develop his own voice, instead of relying on a single-model mold. Style - Examining the four qualities that rhetoric must contain to be considered "good"
By the end of the program, the student should have the skills to write classically-influenced persuasive essays suitable for publication. The curriculum consists of three PDF "books." The first document is the Rhetoric Lesson book. This 235-page document is the textbook. Each week, the goal of the lesson is outlined, along with project assignments. Day 1: Read the lesson text. Define any vocabulary and answer comprehension questions about lesson contents. 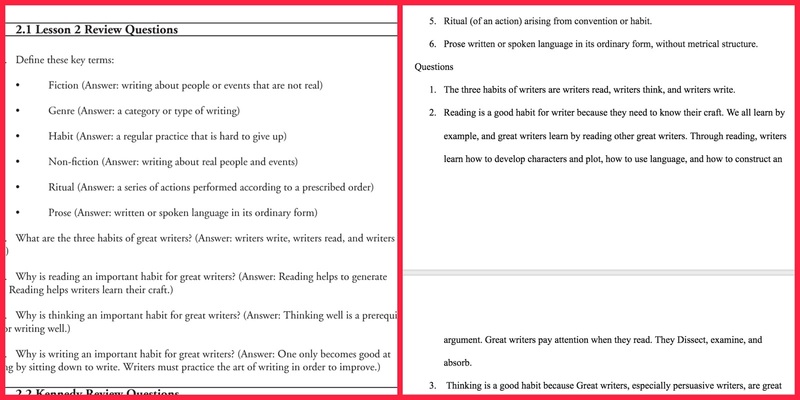 Day 2: Read the writing sample, and answer questions. 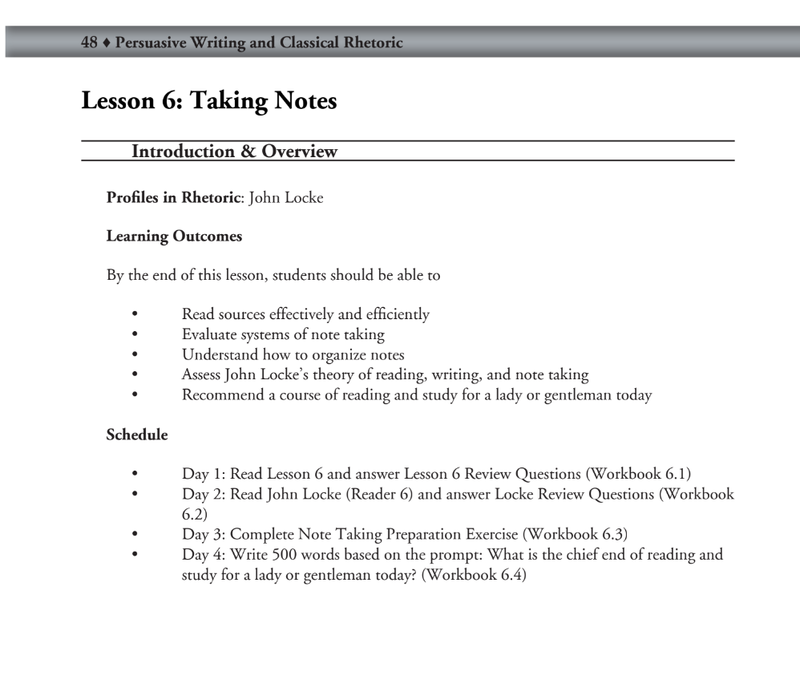 Day 3: Complete workbook exercises that help understand and use the lesson concept. Day 4: Write a 500-word, prompted-topic essay. This is most definitely a writing-intensive course -- "500 words" is approximately two double-spaced pages. The writing is the most time-intensive part of the course as well. So far, Days 1-3 have taken Matthew about 30 minutes a day. He has worked on each writing piece total of about three hours, including research and editing. (This is probably at the lower end of time I would expect for this length of assignment. Luke regularly writes 500-word essays for his college classes, and they usually take him at least double that.) Spreading it over two days -- about two hours to research and draft, and an hour or so the next day to revise -- helps make the assignment both fit into his day better and not become so overwhelming. I think seeing something the next day "with fresh eyes" really helps writing skills develop because the "cold" reading helps the writer see places where he needs to be more explicit or fix a spelling/grammar error that he may have glossed over before. There is also a Teacher Answer Key. YAY!! As much as I often will skim the kids' textbooks, it's just that -- a skim. I appreciate having answers in front of me so I don't have to figure them out, or if I'm not as far in my reading as a kid is. 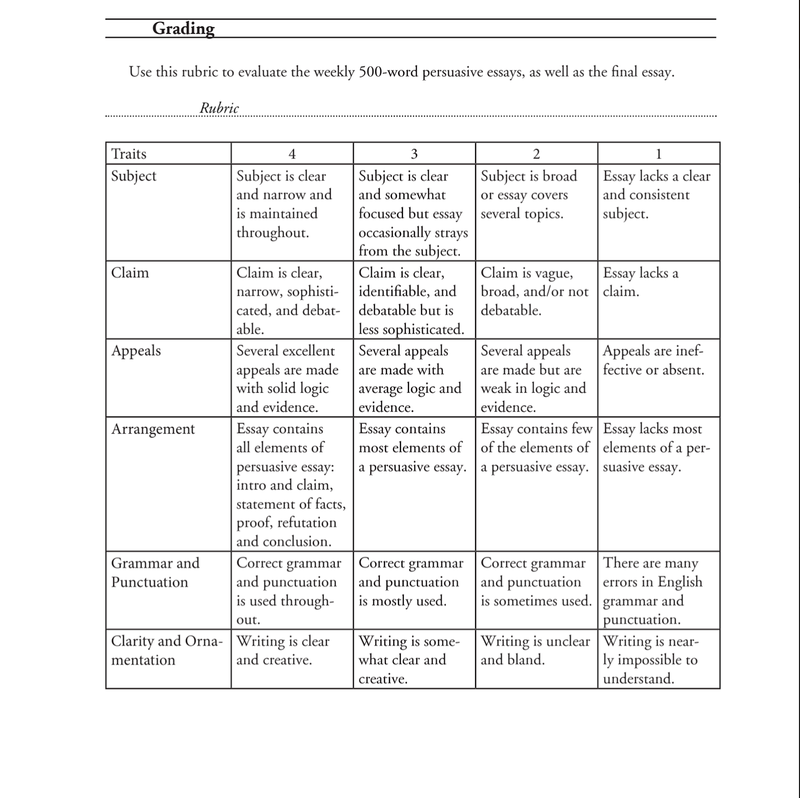 First, there is a clear rubric to help guide grading essays. I like rubrics because they clearly outline expectations. Some things do maintain subjectivity, but when you say "I'm docking this for grammar," the student sees it is an essential component and not the grader nitpicking for mistakes to sabotage his grade. Obviously, not every answer will be in the key - there are some opinion-based answers, but it gives me a good idea of if Matthew has actually read the text, or if he's skimming, too. While we're on the subject of what do good writers do -- they read, they think, and they write. 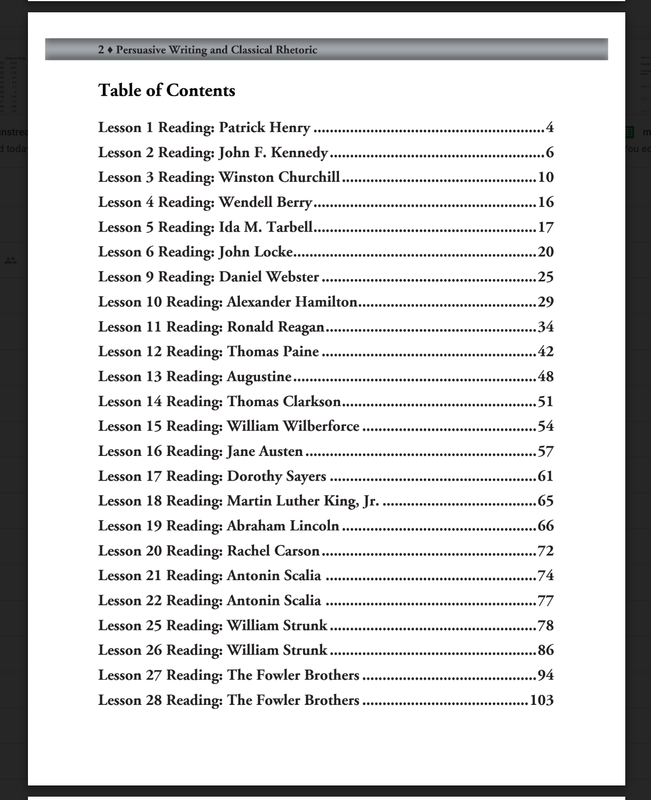 One of the exercises in the program is to compile a specific reading list of books. Matthew is still considering the last "Recommended by someone" title but has created a pretty solid reading list for himself. I require each child to read for half an hour a day, so he now has a list of books to work through, instead of staring at the bookcase and saying "I don't know what to choose." Because this is a writing-only program, he still needs a literature component for a full English credit, so we are taking a few of those and doing literature studies on them. One of them, The Hound of the Baskervilles, will actually be credited towards a "Read a Sherlock Holmes book" requirement in his Forensics course. 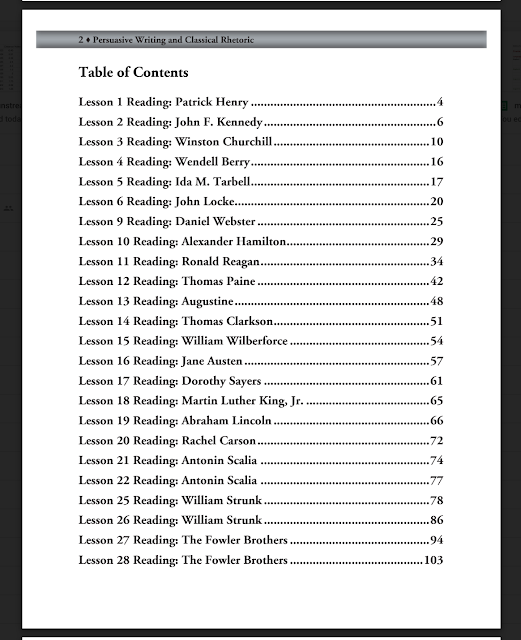 This course has so much work that I have no qualms about counting the reading towards another class. However, I really think the core course is worth more than a single credit. At 36 weeks, yes, it can fit into one "school year." However, the program is really intense at this speed. Unless the student works faster in the early part of the week and condenses lessons, doing lessons x.1, x.2, and x.3 in only a day or two, it means he's writing a research essay in two days or less. It certainly has Matthew spitting out a large quantity of writing, but I'm not sure that it's quality writing. As I said, grammar is an essential element of writing. I have found using online grammar scorers to grade both helps me determine the level of skill mastered and avoids me seeing what I'm "supposed" to see rather than what is actually there. However, is also an independent, algorithm-based program. There are some things I might ignore (if a passive voice sentence makes sense, I don't have an issue with it), but generally, it helps me decide if the essay is worth reading for content or if I hand it right back to Matthew and say, "Try again." I think in the interest of time and being able to get all of his work done, Matthew is taking less time than he should. Noted homeschool writing instructor Sharon Watson recommends allocating a minimum one hours' worth of work for every 100 words expected. At two or three hours total effort, Matthew is definitely not using that full expectation, and his writing shows it. It has become more about "just get something to turn in" and less about crafting a well-written essay. While I believe college-prep courses should prepare students for college expectations, I think this may overshoot the expectations that should be put on a high school student. For comparison's sake, Luke's full-semester college writing assignments have hovered at 200- to 250-word single-topic essays each week. (He is a Business Administration major, so his courses have included Marketing, Management Principles, and Business Law.) His particularly writing-intensive, six-week session Psychology class involved one 250-word original essay each week (there were also two 150-word each responses to others' essays expected), with one 500-word essay and one five-to-seven page research paper (Luke's clocked in at exactly seven full pages containing 1,750 words.) Silverdale Press recommends Persuasive Writing and Classical Rhetoric for students as young as first-year high schoolers but quickly pulls ahead of even an accelerated pace college-level class. I'm sure there are young students out there who are able to keep up, but I think the average or even above-average underclassman will feel overwhelmed at this pace. The content is appropriate for a 9th grader, but I think this program is better undertaken by a student who is at least at a Junior (grade 11) level. 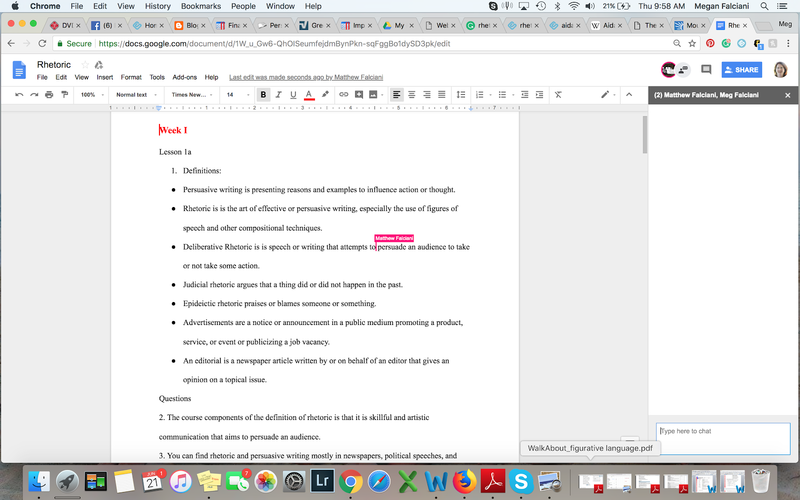 One reason I love homeschooling is we don't have to do 11-hour days, and trying to get the entire essay done - and still not done well - at one time puts Matthew precariously close to doing nothing in a day but schoolwork. If I had a student who was able to keep to this curriculum's pace and completed it in a single academic year, I would definitely award an honors designation on a transcript. However, I really think it would be best completed over two years. Due to the volume of writing, I think it could even be appropriate transcripted as "Classical Rhetorical Writing I and II" and two earned credits. After I started reading through the particulars of the program, I found I really liked its scope, its essay choices, and its general organization of topics. I had intended to tuck this away to be Celia's 12th-grade writing program. However, after seeing how much effort needs to be put in to do it well, I think starting in 11th grade would be a better plan. Alternating weeks will give her three school days to work on the texts and allow the 5-hour minimum for writing/editing to be spread across several days. Overall, I think this is a well-crafted writing curriculum. Rhetoric has gotten a derogatory connotation in recent times because formally presented essays, editorials, and speeches are often manipulative, rather than persuasive. Many have lost the art of persuading others to see their side using facts and logic, and instead become appeals to one's base that entrench the opposition in their views. However, while one may consider rhetoric and politics near-synonymous, rhetorical writing isn't a skill that can only be employed in politics! Consider the need for an inventor to persuade venture capitalists to invest in his product. A tradesman would employ rhetoric when pitching his company in a bid. While one might be mounting an informal solicitation, when an individual wants to raise money for a charity, just saying "I'm running for this cause, please donate!" requires a deftly handled appeal to get more than just your immediate friends to open their wallets. When paced appropriately, Silverdale Press' Persuasive Writing and Classical Rhetoric is a good choice for upper-class high school students to learn and practice writing skills that will benefit them throughout their lives. Some Crew families have been studying Rhetoric, while others have been studying Silverdale Press' White House Holidays Unit Studies. To read their reviews, click the banner below.